Last Friday the residents and staff of Maygrove Village celebrated Jeanne Jury's retirement. She was the village manager for 12 long successful years! We welcome Leonie Knell as the new village manager. Health and Wellbeing graduates from Maygrove Care celebrated in community-based ceremony and it's all featured in New Zealand Tertiary College's website and it was also featured in Hibiscus Matters’ February issue. Maygrove residents have been busy making up gift boxes for the local charity ‘Hibiscus Coast Grandparents Parenting Grandchildren Inc’. The organisation currently supports over 50 grandchildren being cared for by their Grandparents. The aim of the organisation is to provide support and fellowship to Grandparents who are the primary caregivers to their Grandchildren. The organisation resounds with the Maygrove residents who can imagine the strain having to suddenly care for Grandchildren in their later years. Bjorn Modigh President of the organisation relayed stories of the pressure many of their Grandparents are facing but also how the knowledge that communities are behind them and supporting them is such an enormous encouragement, “that people actually care is amazing”. Maygrove Village and residents generously donated goods for over 50 gift boxes including grocery items, toys, clothing and toiletries, a big thank you to all those who have kindly contributed to this initiative. Maygrove Village is pleased to support Hibiscus Coast Grandparents Parenting Grandparents. 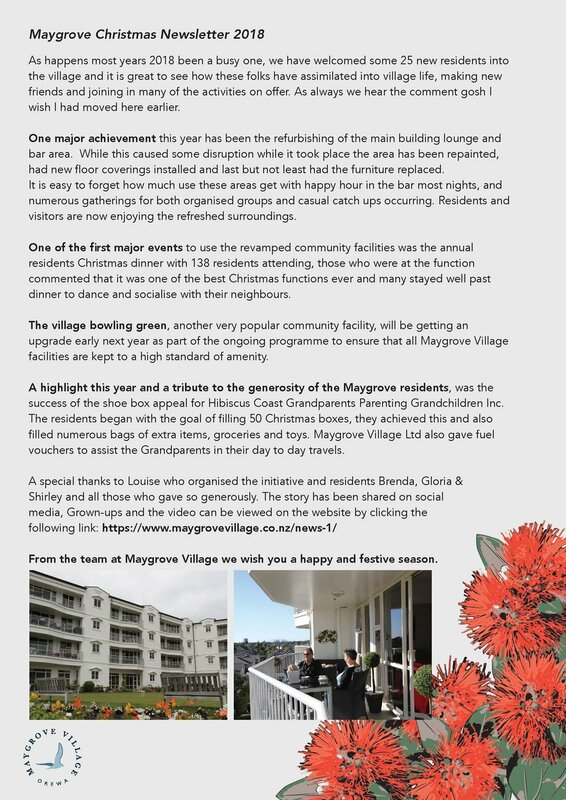 Great article in grownups.co.nz on the Retirement Lifestyle at Maygrove.